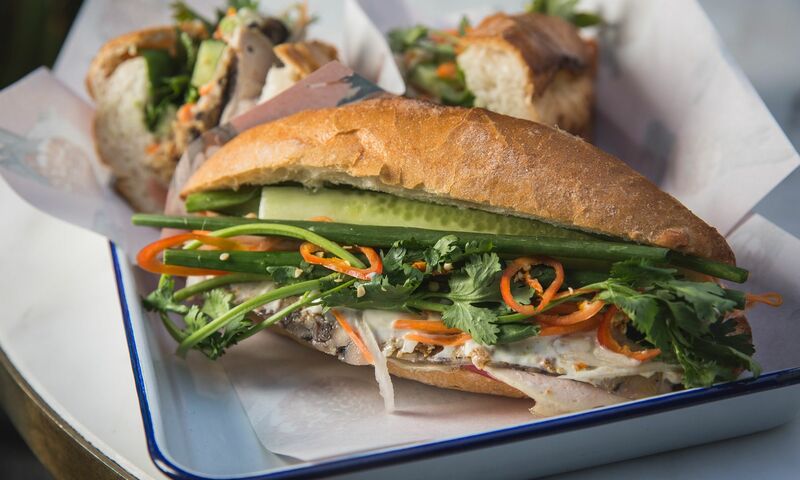 The Star Street Precinct just got a little more interesting with the opening of Le Petit Saigon, the sister branch of Le Garcon Saigon, which serves nothing but a single item – the humble yet ultra-popular banh mi thit. With many budding competitors claiming they have the best Vietnamese sandwich in town, from Central’s Banh Mi Kitchen to the soon-to-open Co Thanh, we decided to test the waters. A good sandwich starts with the bread. Despite its French origins and influence, the bread that makes a good banh mi thit is more than just a humble baguette. Le Petit Saigon head chef Bao La created a bespoke recipe for the bread baked for the banh mi thit. The bread bears a crisp crust with a rich chewy interior that stands up against the mélange of fillings that go into the sandwich. The filling comprises of five varieties of pork cuts. We are particularly fond of the rolled pork belly which is marinated, rolled, and cut porchetta style, as well as the square slices of fromage de tête, or head cheese, made with meat from a pig’s head, including the cheeks and tongue. Created with chef Bao’s family recipe, the head cheese adds texture and a personal touch to the filling, which also includes Vietnamese cold cuts and pork floss. Also in the sandwich are the quintessential pickled radish and carrots, shredded and lightly pickled with a Chinese vinegar, yielding a sweeter, less acerbic taste that helps cut the richness from the chicken liver pate and mayonnaise. The pickle also helps lighten the sharp heat from the chopped Vietnamese chillies which pack an aromatic punch to the sandwich. Unlike many banh mi shops in town, Le Petit Saigon serves no other variations on the Vietnamese sandwich, and all sandwiches are available for takeaway only. The sandwich itself may seem rather large in size but remains quite light and makes a refreshing lunch item especially on a hot summer day. The banh mi thit is priced at HK$88 each and is available from noon every day until it is sold out.